Posterior view of the right latissimus dorsi. Permission Joseph E. Muscolino. The latissimus dorsi attaches from the spinous processes of T7-L5, posterior sacrum, and the posterior iliac crest to the medial lip of the bicipital groove of the humerus. Elevates the same-side (ipsilateral) pelvis at the lumbosacral joint. Anteriorly tilts the pelvis at the lumbosacral joint. 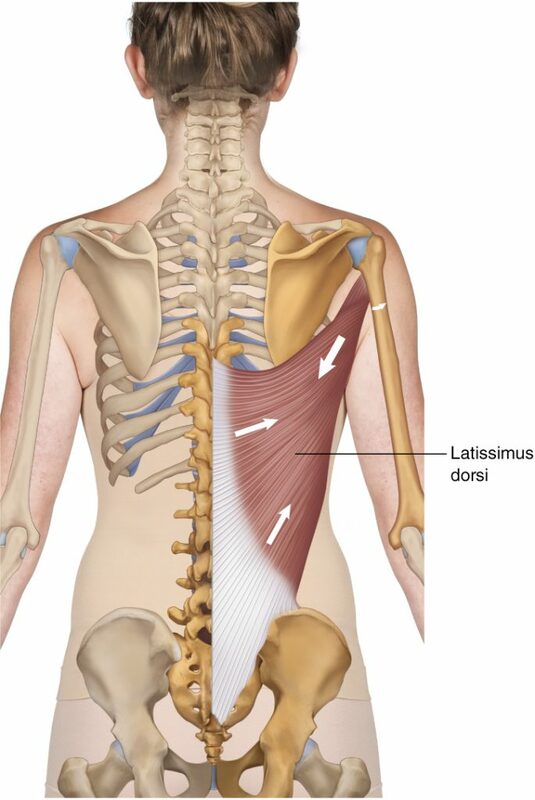 The latissimus dorsi is the principal muscle involved in swimming the freestyle/crawl stroke. For this reason, it is sometimes referred to as “the swimmer’s muscle” and is usually very well developed in swimmers. The latissimus dorsi has the same glenohumeral joint actions as the teres major (medial rotation, adduction, and extension). The latissimus dorsi and teres major comprise the posterior axillary fold of tissue.